Field 2 is a Multipurpose Full-size Field which will be used as a Full-Sized Field and two Small Fields for Grades 1 -4 Boys and Girls activities and Learn to Play Programs. Field 2 if listed as Field 2a will be the short Field to the left (restroom side) as you face the length of the field. Field 2b will be the Field on right. Field 3 is too the right and is a full sized football field. From Route 2 Eastbound (Hartford): Take exit 13 in Marlborough. At the top of the ramp, take a left onto Route 66. Follow approximately 5 miles into the center of Hebron. At the first light, take a left onto route 85 (Gilead Street). East Street is approximately 1/2 mile down on the right. From Route 2 Westbound (Norwich): Take exit 13 in Marlborough. At the end of the ramp, take a right onto Route 66. Follow approximately 5 miles into the center of Hebron. At the first light, take a left onto route 85 (Gilead Street). East Street is approximately 1/2 mile down on the right. From Route 85 North (Colchester): Follow 85 to the intersection of Route 66 in Hebron. continue through light, onto route 85 (Gilead Street). East Street is approximately 1/2 mile down on the right. From Route 85 South (Glastonbury/Manchester): Follow Route 85 South on Gilead Street, past Lions Fairground. East Street will be the next left after the fairgrounds. From Route 66 East (Middletown): Follow Route 66 to Hebron. At the intersection of 66 and Route 85 (Gilead Street), turn right onto route 85 (Gilead Street). East Street is approximately 1/2 mile down on the right. From Route 66 West (Willimantic): Follow Route 66 to Hebron. At the intersection of 66 and Route 85, take a right onto route 85 (Gilead Street). East Street is approximately 1/2 mile down on the right. From Route 6 East (Manchester/Bolton): Turn onto RT 85 South and follow into Hebron.Follow Route 85 South on Gilead Street, past Lions Fairground. East Street will be the next left after the fairgrounds. From Route 6 West (Andover/Columbia): Follow Route 6 to Route 66 West follow into Hebron. Follow Route 66 to Hebron. At the intersection of 66 and Route 85, take a right onto route 85 (Gilead Street). East Street is approximately 1/2 mile down on the right. Field 3 is a Lacrosse/Football Field which will be used as a Full-Sized Field for Grades 5-8 Boys activities. Field 3 is located in the back right of the complex behind the parks building. Look for the football goalposts. Continue south on HARTFORD AVE / CT-189 through Granby & Tariffville into Bloomfield. Continue south on Tunxis Rd./ CT-189 through Bloomfield Center. When CT-189 crosses CT-178 (Park Ave./ Mountain Ave., it will turn into Bloomfield Ave. Continue south on Bloomfield Ave./ CT-189. At the intersection of Cottage Grove Rd./ CT-218, turn right onto Cottage Grove Rd./ CT-218 & continue west. Cottage Grove Rd. will eventually bear left & turn into Hall Blvd./CT-218. Continue south on Hall Blvd./ CT-218. 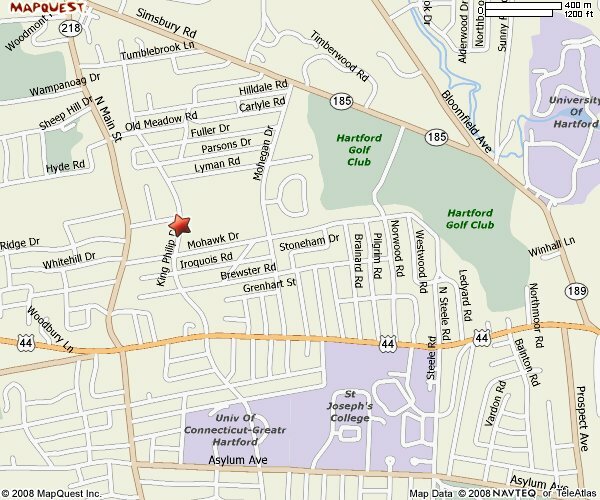 At the intersection of Simsbury Rd., Hall Blvd./ CT-218 crosses into West Hartford & turns into North Main St./ CT-218. Continue south on North Main St./ CT-218. You will pass Hall High School, Albany Ave., & Asylum Ave. Continue south on North Main St./ CT-218. At the intersection of Farmington Ave.,, North Main St./ CT-218 will turn into South Main St./ CT-218. Continue south on South Main St./ CT-218. Continue south past Rockledge Golf Course. Continue south on South Main St./ CT-218 for several hundred feet & look for West Point Terrence. It will be the first right after Rockledge Golf Course. Look for West Point Terrence and turn right. Follow West Point Terrace to the end & the fields will be in front of you. If you reach I-84, you’ve gone too far! Go south on Salmon Brook St./ CT-202/10. When you enter the Town of Simsbury, CT-202/10 will turn into Hopmeadow St./ CT-202/10. Continue south on Hopmeadow St./ CT-202/10. You will pass West St./Ct-167/309 on the right. Follow HARTFORD RD/CT-185 S over Talcott Mountain. On the top of the Talcott Mountain, you will cross into the Town of Bloomfield. HARTFORD RD/CT-185 S will turn into Simsbury Rd./CT-185 S. Continue south on Simsbury Rd./CT-185 S.
At the bottom of the mountain, turn right onto North Main St./ CT-218. You will cross into the Town of West Hartford. Continue south on North Main St./ CT-218. Take I-84 westbound toward Hartford. Continue thru Hartford into West Hartford. Take a right turn onto South Main Street. You will be confronted with a traffic light almost immediately. This is the intersection of South Main Street & Beechwood Rd. If you are able to, take a left turn onto Beechwood Rd. Proceed west for 1 block, to Ashford Rd. The lacrosse fields are located on the northwest corner of the intersection of Beechwood Rd. & Ashford Rd. They are visible from the road. Turn right onto Ashford Rd. The pedestrian entrance to the fields is at the intersection of Ashford Rd. & West Point Terrace. If you cannot make the turn at Beechwood Rd., refrain from panicking. Simply proceed north on South Main Street for 1 block, to the intersection of West Point Terrance on the left. Turn left onto West Point Terrace & proceed west for 1 block. The pedestrian entrance to the fields is at the intersection of Ashford Rd. & West Point Terrace. Get off I-84 at the junction with I-291 westbound. Follow I-291 westbound to the end, in Windsor. Take Exit #1 to CT-218 (also known as Cottage Grove Rd., in Windsor. Follow CT-218 (also known as Cottage Grove Rd.) westbound for approximately 4 miles. You will eventually enter the Town of Bloomfield. You will pass a shopping center containing a Super Stop & Shop, a McDonalds’, a Boston Market & a Strawberrys. The road will eventually take a 90 degree curve to the left & become Hall Rd. Continue on this road southbound. You will eventually cross Simsbury Rd. & enter into the Town Of West Hartford. Hall Rd. becomes North Main Street. Continue southbound on North Main Street past Hall High School. You will pass Hall High School, Albany Ave., & Asylum Ave. Continue south on North Main St.
At the intersection of Farmington Ave., North Main St. will turn into South Main St. Continue south on South Main St.
Continue south past Rockledge Golf Course. Continue south on South Main St. for several hundred feet & look for West Point Terrence. It will be the first right after Rockledge Golf Course. Take Exit 85 (Wethersfield/Rocky Hill — 99 S). * Take Route 44 East into West Hartford. * Turn left onto King Philip Drive. * Proceed for 3/10ths of a mile. Turn right onto Mohawk Drive. * Proceed for approximately 200 yards. Turn left into the driveway leading to the back of the school. * Exit at the Park Road / West Hartford Center exit. * Turn right at the bottom of the exit ramp. * Turn right onto Mohawk Drive. Continue southbound on North Main Street past William Hall High School & then past Proctor Dr. Huron Dr. is near Proctor Dr.
At Huron Dr., take a left turn. Drive eastbound on Huron Dr. until it ends, at King Philip Dr.
You will be facing a large brick structure, which will be King Philip School. Turn right onto King Philip Drive & drive south past the school to Mohawk Dr. Turn left onto Mohawk Dr. & drive eastbound. The driveway into the rear of the school will be on the left. The lacrosse fields are located east of the gym. Directions: The fields are located in the back of the school. The easiest entrance is via Mohawk Drive. Fields are in the back right corner behind the baseball fields. There is an additional parking lot on King Philip Drive in front of the school. If multiple events are going on use this lot as the back lot fills up. Follow I-91 S Exit 22 to Rt. 9. Follow Rt. 9 to West St. exit. Take a right at the end of the exit; take an immediate left onto Rt. 3. Follow Rt. 3 for approximately 1 mile. At the stoplight take a right onto Mile Lane and continue 0.5 mi. take a right onto Kaplan Drive. Ending at Lawrence School. Comments: on Regan rd. @ intersection with West St. Turf field, Barn Field, and Lower field are located on the west side of campus. Follow signs to Athletic Center and take the South Entrance. Observatory field is on the east side of 44/169. Follow signs to Observatory / Alumni Office. Please do not bring dogs onto the turf field. There is plenty of parking in the lot below the fields. Please do not park along the baseball fields.